and wonderful travel partner (Dan Burgoyne). By day she works for the Maryland Department of Business and Economic Development assisting businesses and local governments in rural areas. 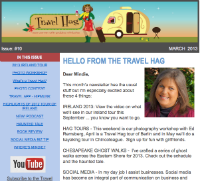 In evenings and on weekends she writes, blogs, speaks, trains on social media and guides occasional tours for women. When she can get leave, Mindie and Dan roll along American roads with r-pod in tow, scouting out the best fishing spots, flatwater kayaking trails, historic towns, haunted houses, and the friendly people along the way. Mindie is the author of three published books – In addition to Haunted Eastern Shore, published by History Press, she wrote Snow Hill: Images of America and Easton: Then and Now about historic towns on the Eastern Shore of Maryland published by Arcadia Publishing Company. Mindie’s writings and photography have appeared in The Vancouver Sun, CBS News, National, Catholic Reporter, National Geographic Television Network, Music News, What’s Up Eastern Shore?, Metropolitan Magazine, Coastal Living, Maryland Life Magazine, and numerous business and travel websites including the Irish Fireside which named her blog posts among the best writing of Irish interest in both 2010 and 2011.
success in using social media platforms, Mindie also trains and speaks on the use of Social Media to grow a business or platform. She has presented workshops and keynote speeches for the Delaware Association of Realtors, the Maryland Writers Association, Salisbury University, Bay to Ocean Writers Conference, Charles County Economic Development Summit, the Maryland Economic Development Association and State Farm Insurance. Her list of clients is extensive. Mindie operates three blog sites: The Travel Hag, Thin Places – Doorways to the Eternal World, and Who Cares What I Think? Additionally she blogs regularly for CBS News Travel and Outdoors and MDBiz Media. Her next book, Thin Places: Celtic Doorways to the Otherworld, is about mystical places in Ireland – or places where the veil between this world and the eternal world is thin. On May 15-24, 2011 Mindie escorted a group of guests on a tour of Ireland’s southern region visiting mystical, sacred sites in Ireland, rarely seen by the tourist. In her Thin Places blog and Thin Places Tour of Ireland site, Mindie details and recounts experiences in these mystical places in Ireland and the UK. Mindie runs annual tours to Ireland visiting “thin places” or sacred sites. She also serves as a step on guide for tours in Maryland and runs her own haunted tours of the Eastern Shore every October. See Mindie’s Calendar for more details.